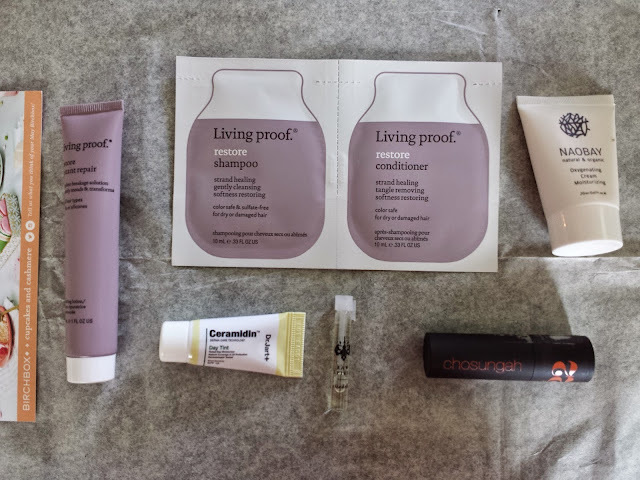 Fun fact: Birchbox has an awesome points system where you can review products or make purchases from the Birchbox shop to earn points. Every 100 points gets you $10 credit in the BB shop. 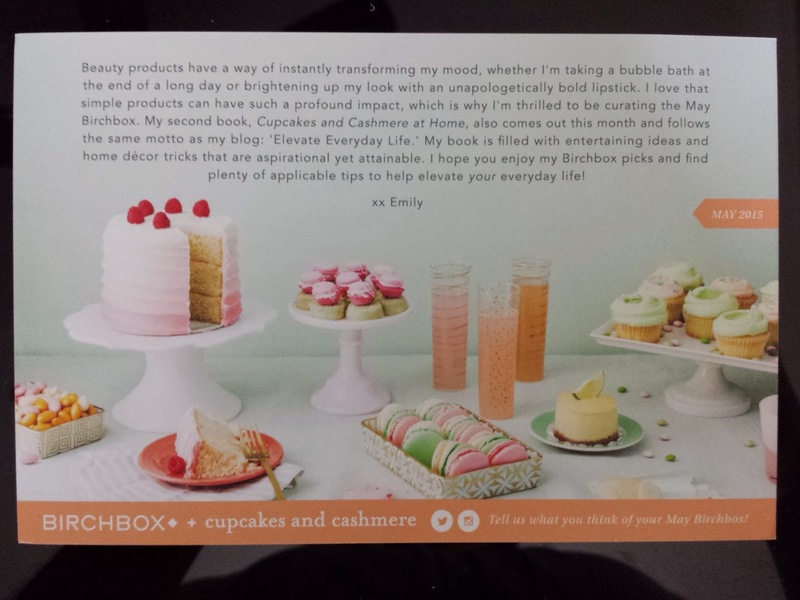 Each month Birchbox collaborates with a company or individual to curate a box. Usually there's also a book promo where if you spend so much in the Birchbox shop you can get the book of the month for free. This month's partner and author is Emily Schuman of Cupcakes and Cashmere, a blog about contemporary fashion, food, beauty, and decor. I seriously think this blog could easily find its way into my daily readings because THIS COOKIES AND CREAM CAKE RECIPE. If this is a snippet of what the rest of the blog has to offer, I'm so game. Dr. Jart+ Ceramidin Day Tint (0.17oz sample value: $4.80) - Dr. Jart is a Korean-based skincare brand that's since branched out into a number of countries. In fact, Birchbox has been dishing out Dr. Jart goodies since before I subscribed almost two years ago. I don't remember exactly what I received before, but it was some kind of moisturizer. And now here's another one, but tinted and with sun protection. As the name implies, Ceramidin Day Tint is formulated with ceramides, which are naturally-occurring lipids found in cell membranes in the skin and help to prevent loss of moisture. As skin ages, ceramide production declines and cells aren't able to retain moisture as effectively. 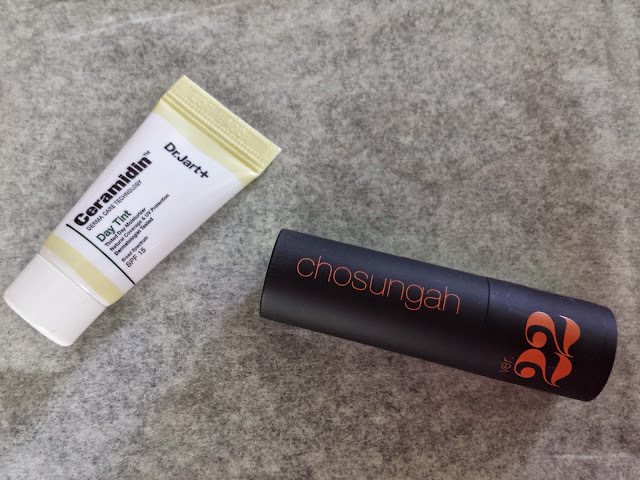 That's where topically applied ceramides come in (yes, they can be absorbed by the skin). But here's the thing: ceramides are only effective when it's combined with cholesterol and free fatty acids at the correct ratio. I haven't been able to find a complete ingredient list so I can't say whether this cream sounds promising. Raw Spirit Fragrances - Citadelle (sample vial) - At $90 per ounce, I was hoping to feel like a million bucks taking a whiff of this. But it made me feel kind of masculine. (Does masculine = a million bucks? You decide.) The first thing I thought was, hmm...woodsy. Like cedar or something. Or maybe pine. Okay I'm kind of terrible at pinning down fragrances, but I do know it's not really for me. Maybe Raw Spirit can describe it better: "A modern interpretation of a classic vetiver fragrance, blending premium Haitian vetiver, marigold, pear, bergamot, lemon, cinnamon, nutmeg, amberwood, musk and cedarwood." Well at least I got the cedarwood part correct. This is a unisex fragrance, but as I mentioned earlier, it's a bit masculine for me (I prefer sweet and fruity scents). Part of the proceeds from fragrance sales will support sustainable Haitian agricultural projects, and while that sounds terrific, I just can't bring myself to love this one. Maybe some of the other scents will sound more appealing to me. Naobay Oxygenating Cream Moisturizer (0.67oz sample value: $14.20) - Naobay is an organic, cruelty-free brand that started in Spain. 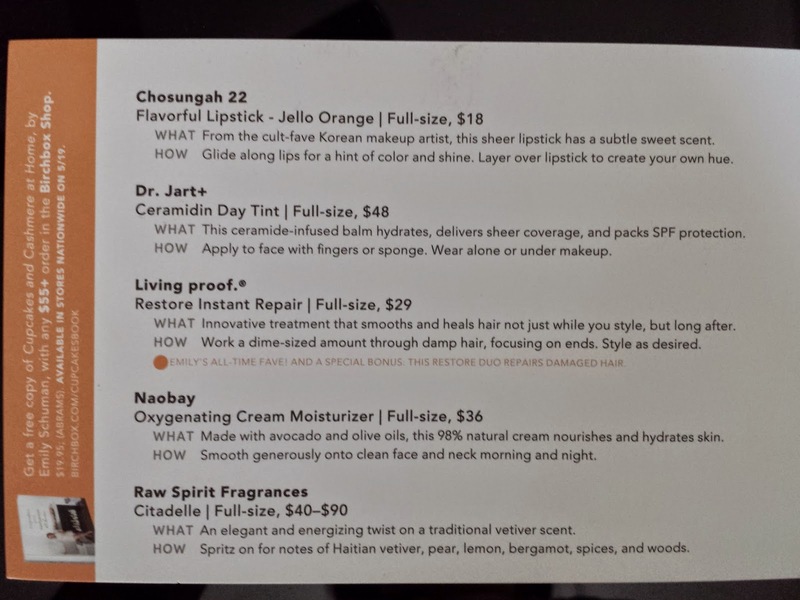 I remember getting the Naobay Radiance lotion a while back, and then I remember seeing Naobay popping up in someone's Birchbox almost every month since. Aside from consistency, I'm not exactly sure what the difference between the two are, as the main ingredients are the same. Avocado and olive oil offer intense hydration for dry skin, and the fatty acids can help fill in fine lines as well. 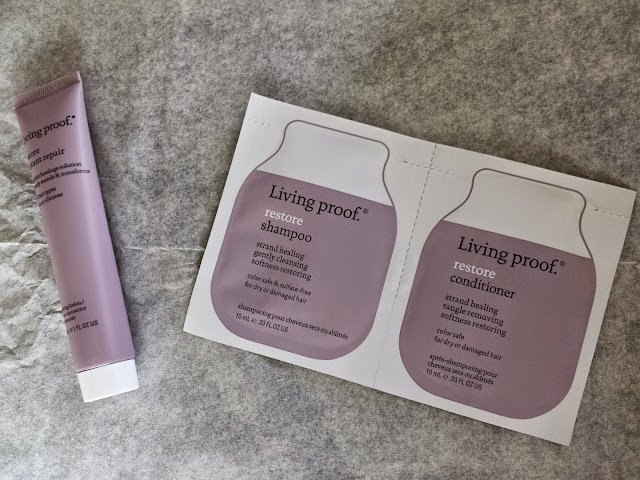 Living Proof Restore Instant Repair Lotion (1oz travel size: $7.25...also included were shampoo and conditioner foils to complete the set) - Lots of things claim to repair split ends but if you really think about it, unless you literally put glue on your hair, it's pretty impossible to fix a split end without snipping it off. This repair lotion/cream supposedly coats the hair shaft with...lotion?...and seals those hair cuticles and split ends. So this is a temporary fix until the next time your hair gets wet and the coating washes off. The other half of this cream is preventive maintenance. It prevents 93% of new split ends (how did they get that number??) and makes hair 15 times stronger after just a single use. Again I'm thinking these effects are only temporary because it's essentially just a coating of cream "sealing" the cuticles and making hair feel less brittle until the next time you wash it. So this is basically the same as every other hair cream on the block. Don't get me wrong, I love my hair oils and creams because they make my hair feel soft, but keep in mind it's not a permanent thing and once you stop using it your hair will most likely go back to how it was before. After all, hair past the follicles are made up of dead cells, and there's not much one can do to bring those cells back to life and kickstart repair mechanisms. So this box was kind of a dud for me. Nothing was super interesting or made me feel like I NEED IT NOW. Well, orange jello sounds interesting. Maybe I'll hold onto the lipstick just to get over my orange fear. But everything else will be finding a new home. *sniff sniff* I think it's time to change up my profile a bit. I've been getting way too many moisturizers and I'm sort of swimming in them right now. 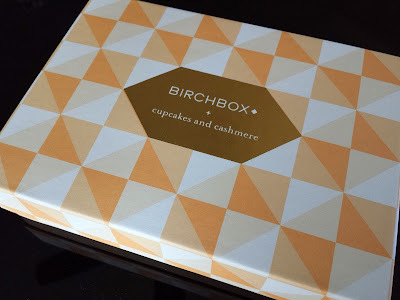 If you want to subscribe to Birchbox, please sign up here. It looks like they're venturing into more foreign brands which can only make things even more fun. And who doesn't like fun?!! Note: Post contains referral links. All opinions contained within this post are my own. What the crap!? Chosungah!?! Really!! That is SO awesome! 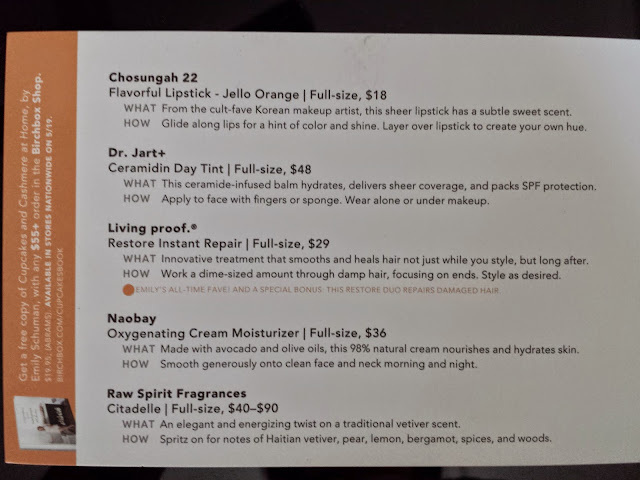 I would love it if Birchbox got on the kbeauty bandwagon for real! Too bad it's orange. Ew.